Astronauts F. Story Musgrave, anchored on the end of the shuttle's robotic arm, and Jeffrey A. Hoffman inside the orbiter's payload bay, conduct the fifth and final spacewalk to fix Hubble during the shuttle Endeavour's 1993 servicing mission to the orbiting observatory. 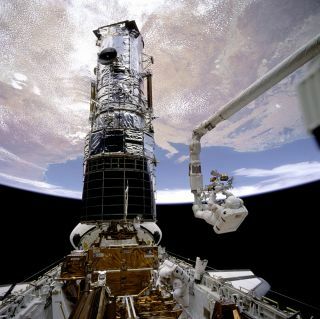 When the Hubble Space Telescope launched into orbit in 1990, the observatory promised to provide dazzling and unprecedented views of space that would rewrite humans' understanding of the cosmos. But soon after the $2.5 billion telescope was turned on, mission managers knew something was horribly wrong: Instead of rich and vibrant views of nebulas and galaxies, the images beamed back from Hubble were fuzzy, and seemed out-of-focus. It was later discovered that a slip-up during Hubble's construction phase left its main mirror flawed. The telescope's blurry vision dealt an embarrassing blow to NASA, and the task of repairing Hubble fell to seven astronauts, who embarked on a bold mission in 1993 to restore the observatory's sight — and, in effect, to rescue the agency's reputation. This month marks the 20th anniversary of STS-61, which would become the first of five space-shuttle flights to upgrade the Hubble Space Telescope. On Dec. 2, 1993, astronauts Richard Covey, Kenneth Bowersox, Kathryn Thornton, Claude Nicollier, Jeffrey Hoffman, Story Musgrave and Thomas Akers launched aboard the space shuttle Endeavour on a mission to correct Hubble's faulty optics. The astronauts spent more than a week in orbit, and completed a record-setting five consecutive days of spacewalks. "This was the most complex shuttle mission that had ever been undertaken," Hoffman said Nov. 13 at a symposium to mark the 20th anniversary of STS-61. "There were a lot of people who doubted that we could accomplish all the things we had set out to, but here we were at the end of the fifth of five [spacewalks], and we had accomplished 13 of the 12 tasks that had been assigned to us — so we were, justifiably, very happy." Hoffman, now a professor in the department of aeronautics and astronautics at MIT in Cambridge, Mass., helped organize the event, titled "Rescuing Hubble," which was held Nov. 13 at the MIT Bartos Theater. This 1995 Hubble Space Telescope image of the 'Pillars of Creation' is probably the most famous astronomical image of the 20th Century. Taken in visible light using a combination of SII/H-alpha and OIII filters, it shows a part of the Eagle Nebula where new stars are forming. The tallest pillar is around 4 light-years high. Hubble's observations have enabled scientists to peer deep into space, and the telescope's observations have led to breakthroughs in astronomy and astrophysics, such as determining the rate of the universe's expansion, and characterizing the atmospheres of alien planets. Hubble also played an important role in connecting the sometimes-separate worlds of human space exploration and scientific study, Covey said. "In my mind, there's the human spaceflight program, and there's the space science stuff — and occasionally, they had to deal with each other because the science guys needed a ride, or there were some shuttle missions that were dedicated to science," Covey said. "But still, there was a lot of 'them' and 'us.' This mission bridged that gap in a way that I had not seen before in the space-shuttle program." Last month's "Rescuing Hubble"event reunited five of the STS-61 astronauts and members of NASA's mission control, many of whom had not spent time together as a group since the 1993 mission. The team reminisced about the flight and the legacy of the Hubble Space Telescope. "It's such a beautiful instrument," Hoffman said. "It was a true privilege to live with Hubble for a week up there, especially — I have to say — for myself, being trained as an astronomer. As an astronomer and an astronaut, to put one's own hands on the Hubble Space Telescope in space is a real thrill." Musgrave called the STS-61 crew "the greatest group that ever flew." "I saw us doing what NASA should do: unbelievably good teamwork," he added. Covey commanded the STS-61 mission, and spoke with pride about the work done during the flight. "When I got back, I think I called it a 'noble mission,' and I truly believe that," he said. "This was one where I truly felt like I had gone beyond human spaceflight, and our crew had gone beyond human spaceflight, to enable great science." Covey retired from NASA eight months after the STS-61 mission. He said the Hubble flight was the perfect capstone to his spaceflight career, claiming, "That's going to be as good as it gets to me." "I could not think of any spaceflight that I could fly in that would be more significant, more important and more fun than this one," Covey said. "It was truly a pleasure to fly with these guys and work with this team. It was good work." Follow Denise Chow on Twitter @denisechow. Follow us @Spacedotcom, Facebook or Google+. Originally published on SPACE.com.